Ever since Kinji hit about 4 months old, (he's 5 mos old) he pulls the leash as hard as he can until he literally chokes. I've shortened the leash in some vain attempt to get him to walk beside me. I end up almost getting my arm pulled off. It all comes down to his need to dart and pursue any little smell or sight and just overall goes much faster than me. I try to jog with him sometimes but he often mistakes this activity for aggression and tries to jump up and bite me and the leash. I really wish there was some way I could let Kinji off leash so he could run free like he so wants to. My yard is small and he's fine with fetch in it but this dog really wants to RUN and FAR. The many times he's darted out of the house, he will do whatever the hell he wants until HE decides he wants to come back. I can usually trick him into thinking he's going for a ride by opening the car door and he will jump in there but short of that, he basically wants to dowhat he wants and is very willfully hellbent on not coming when called, not behaving on the leash, and not returning when he does get loose unless he wants to. Shibas are known to be stubborn at not listen when called upon. Recall training is tougher for this breed compared to others, but not impossible. The way I did it was I walk, he follows. I stop he stops. If he walks ahead and tugs on the leash, stop walking until he stops tugging. If he starts to pull a different direction, don't let him guide you. He needs to learn to follow your lead. It helps to lure him with treats. Reward him every time he follows your lead. and as always, avoid negative reinforcement. 5 months is young, so be patient -- but early training will be better in the long run. Thank you @kiba888. Rewarding with treats - ah - another thing he's seemed to turn into some jaded game. He doesn't seem to understand he only gets a treat when he does what I want him to do (despite repetition of words and association, etc). He acts like my withholding of his treats is me being mean. He gets both angry and upset. When he does finally do as I say, and I say, good dog and give him the treat, he swallows it whole and expects another, not associating his behavior with the treat or the words. I hope you are right that there is hope he can settle down. I rarely use negative reinforcement...just seems to make him nervous but will say NO if he's doing soething terribly wrong ( and boy does he talk back - snarls, snaps and barks, sometimes with a thorough attempt to leg hump). recall training. oh my gosh what I wouldnt do. I've never owned a dog who was so bad at recall. It's to the point where it almost feels insulting, but I am aware that this breed just really struggles with commands. It seems it gets better with maturity and consistency... Oh man. I hope so. and I cannot wait to pay a man to cut this dog's balls off. Are there any puppy classes available nearby where you live? Sounds like it could be useful to you, the trainer can give you advise, your puppy can blow off some steam and you will also be comforted by the fact that most other puppies misbehave too. What you think of as aggressive behaviour sounds like an over excited puppy to me. And in that state of mind he isn't learning much. What other activities are you doing other than playing fetch? Is he able to relax in between activities? I understand your pain fully. Jibo is 4 months old currently and for the longest time he would pull on the leash. As of right now he isn't perfect, but he's improving. I first tried the method of being like a tree and stopping whenever he would tug. After a while he began to learn that tugging got him no where, so he would sit each time I stopped. I then added another step of recalling him each time he would get to the end of his lead, and rewarding him with a treat once he came back to me. Now, he rarely tugs and if he feels the lead getting tight, he comes back to me. If Kinji doesn't understand that treats are a reward, make sure to be repetitive and clear. A problem I found while trying to train Jibo is that I added in words and talked to him while I was trying to tell him commands and he would end up not knowing what I wanted him to do. My advice to you would be to stay calm and have hope in yourself! I'm sure with time and correct training Kinji will learn. Good luck! Its definitely possible to have a good recall, but it will require work. Mine is like 90% good on recall on a long leash (30ft) if he doesnt come then I reel him in. Problem with shibas is that theyre highly prey driven, the hunt is in their blood hahaha. You have to make coming to you is more fun, more important than evrything else thats out there. is it possible, that someday, sooomeday I will at least be able to trust him off leash? Depends how much time & energy you're willing to put into training absolute perfect recall, as well as the area you're in. If there's a lot of external stimuli like squirrels and other small animals, I doubt it. I'd like to think my Shiba has near-perfect recall, but even the slight ruffling in bushes will send him to chase it. I cannot wait to pay a man to cut this dog's balls off. Neutering a dog will not improve walking on a leash or listening to commands, unless you're joking—which I hope you are. Quake used to pull on the leash when I first got him but he did very well with the "heel" command and now even when I do not command for him to "heel"; he pretty much remains at my side during our walks. I would rather that he walk by my side so that I can keep a close eye on things on the ground that he might want to pick up and I can give him the "leave it" command immediately or even pull him away from something I do not want him picking up. It has made our walks very enjoyable. Every five minutes or so he also gets to sniff for a while and then we go on our way again with him by my side. Maybe you can practice the "heel" command with your Shiba. There are some videos on you tube that show you how to teach the "heel" command. I commented in this discussion when having issues with Rooney walking: http://www.shibainuforum.org/forum/discussion/comment/230056#Comment_230056 Maybe there will be something in there to help you as well. I think you should get him a harness just based on the fact that the pulling he's doing could be causing damage to his throat. My friend leash trained her puppy to walk next to her using a long wooden spoon dipped in peanut butter, then frozen. She carried the spoon with her on walks and held it right next to her where the dog could lick it if he was walking where he was supposed to walk. The spoon would be taken away any time he started pulling/not behaving correctly. Seems like a really inexpensive, great idea if Kinji likes peanut butter. - I let him sniff things off to the side, lollygag, and stare at people so long as he does it within the span of me asking "pee-pee" three times. After that I say "come on" and it's time to walk. He's become a lot better at walking now that he knows he has time if he wants it and that I'm not going to make him miss something interesting. - Varying the walk route so that he doesn't get bored always going the same way. - Always standing the opposite direction from the one I want him to go when he stops to sniff, pee, stare, stargaze, etc. I'm in his way, so it's easier for him to go the other direction, which is the way I wanted him to go. - When all else fails, I play "see this treat, go get it." and throw treats about 5-7 feet in front of us until he's moving well in the direction I want again. I was really consistent with the above and within about 1.5-2 months, he was 98% better than when he started. There are still setbacks, but they're miniscule. From what you (OP) are describing, it sounds like you are ascribing a lot of human motives and feelings to what your puppy is doing. 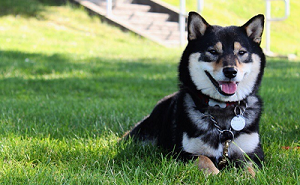 It also sounds like your timing is probably off and that you are unsure about when to give rewards and what to do afterwards, or how to redirect very typical Shiba puppy behavior. I would strongly suggest some one on one training with a positive trainer (who is certified) to help you learn when to reward, when to ignore, and when to redirect behavior. Your puppy is at an age where everything is interesting, and even dirt is more interesting then you are right now, and that he probably needs more exercise (open running spaces). Re the escaping, please consider some door bolting training and get a pet gate, or expen off the area around your entrances so the puppy learns this is a no go zone without permission. Door bolting and recall training are perhaps some of the most important rings you can reinforce to your puppy simpler for safety reasons. It's much more important than teaching sit or down or heeling. will help, as, much of his drive isn't prey, but the neighbor's unspayed female. He does walk on a harness. I'm pretty sure he'd have strangled and asphyxiated himself if I just used his collar! lol but he does still pull to the point of choking, gagging, coughing, even vomiting. It comes down to - he was wants to go much faster than I can or will go, and he also doesn't want to go in the direction I want to go. I really hope to continue to be consistent and that as he matures, the repetition and consistency might sink in. He is still very very young, and you certainly didn't purchase a lab. At almost 8 months, our boy still isn't great on a leash, and his recall is terrible. Working with "heel" and "holt" helped a lot, but you have to be very consistent. I think it helped a bit not letting him get his way, if he pulls somewhere, I wont carelessly follow - I stand my ground and wait for him to calm down. He is still pretty bad on a leash outside, but in the hallways he is now very good at staying at our side. Start carrying treats outside with you, and call him back to you and treat. He needs to learn that "by your side" is interesting and worthwhile. I think you may have your hopes up too high in wanting an off leash dog for the woods. There are a few I have heard of, but those have had years of dedicated consistent training, and even then aren't 100 percent. Just remember that you are dealing with a very young dog. Has he been to puppy classes yet? Bella my parent's boxer was horrible on the leash it took her while, but eventually she showed progress and walks well on the leash. She was 40lbs as young dog and her pulling was strong! now she is 56lbs of muscle luckily she walks good on a leash. Nova, You are correct these are issues that need to be managed better. Yeah, Rome was not built in a day though and your pup is only 4 months. What you describe is typical on your dog's part. Age wise it is at the beginning of naughtiness for a Shiba as it is developing its cognitive independence. Get thee to a trainer that is NOT dominance based. Use Baby gate and barriers + positive motivation training to help yourself out. @nova Hi! My boy is 11 months old now and he also used to pull a lot but has gotten a lot better with patience and consistency. We've gone to several positive training puppy classes and tried different methods (being a statue, frequently changing directions, bringing the tastiest treats we could think of, lots and lots and lots of praise) - no jerking on leads or anything like that. We added a command "steady" which just means slow down and pay attention to where we are. Lots of praise when he does. We also took lots of short walks to train and trained a lot indoors where there are no distractions - without lead - to just follow on our side to get tasty treats. It feels like its taken forever but he is so much better now. Your pup is so young and everything is so exciting to him now. I'm not sure if I misunderstood your other post but does he only get one or two walks per day? At that age I think we took Yoshi on 4-6 short walks a day as he also refused to potty in our garden. If we were both working I'd cycle home at lunch. I think it helped him to take several short walks down the same route/s a day as he then got used to the area, and even though it was still super exciting being outside it was also very familiar for him so he would eventually calm down and pay more attention. As soon as he did we did short fun attention excersises with lots of treats.